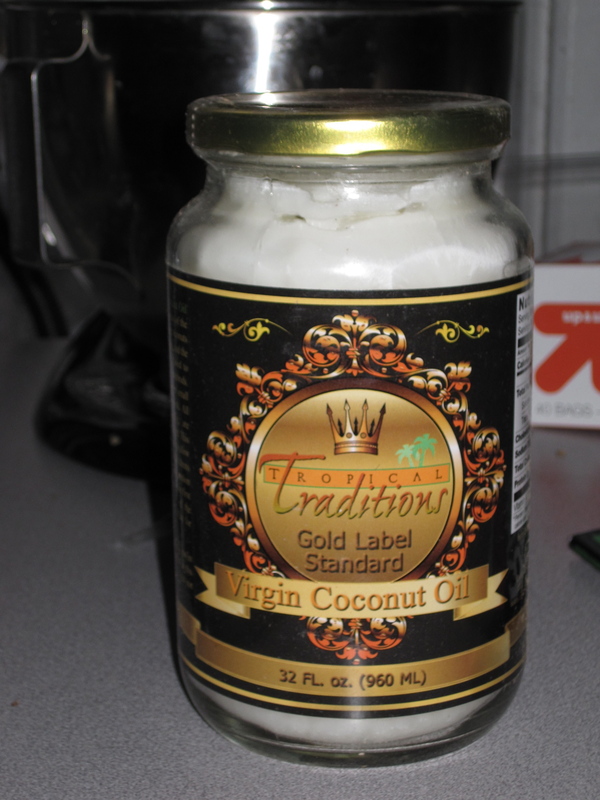 Giveaway & Review: Tropical Traditions Coconut Oil | Cook. Vegan. Lover. The winner is Averie from Love Veggies and Yoga! Tropical Traditions sent me a jar of their Virgin Coconut Oil to sample- it is also organic. What is great about the gold label brand is that it is made by hand unlike other coconut oils. I love coconut oil and this stuff is great. I use coconut oil to make a number of raw dishes – my favorite way to use it is in raw macaroons. I also love to use it in stir fries instead of peanut or canola oil because it gives the stir fry a really great flavor. Yesterday I actually heated it up and sprinkled it on my kabocha squash before I roasted it and it was delicious. To win your own jar of Tropical Traditions Virgin Coconut Oil visit the Tropical Traditions website and take a look around- leave a comment on my blog telling me something you’ve learned or about a product that interest you. Visit Tropical Traditions Free Coconut Recipe website http://www.freecoconutrecipes.com/ and leave a comment telling me what your favorite recipe is. Tropical Traditions also has a Referral Program, so if you place an order with them as a first-time customer, please select “Referred by a friend” and in the box that says “How did you hear of us?” enter my sponsor ID number… 5611571. By telling Tropical Traditions that I referred you, you will receive a complimentary copy of the book Virgin Coconut Oil: How it has changed people’s lives and how it can change yours! by Brian and Marianita Shilhavy with your first order! This book is filled with testimonies and research showing how healthy coconut oil is, and it also includes over 85 recipes showing how one can incorporate coconut into their diet. 2. You’ll be directed to the Order Form at the Tropical Traditions/Healthy Buyers Club website. You do not have to be a member or purchase a membership to buy from Tropical Traditions. Membership in the Healthy Buyers Club allows you to purchase in bulk amount at club member discounts if you choose to join. If you choose not to purchase a membership to the Healthy Buyers Club please order under the heading “Retail Sale Items”. This will enable you to purchase less than case amounts of any of the individual items without a membership. 3. Select the items you would like to purchase. 4. When you are ready to check out please click on the “Continue” link which will take you to your shopping cart. 5. Review your order and then click on the “Check Out” button from your shopping cart. 6. Fill in your account information as directed. In the box: “How did you hear of us?” you must select: “Referred by a friend” on the drop down arrow. When you make this selection, a box for your sponsor’s User ID number should appear if you are a first time customer. 7. Enter your sponsor’s User ID number 5611571. 8. To complete your order click on “Save and Proceed to Checkout” at the bottom of this page and follow the instructions through the checkout process. You will receive an order number when you have successfully placed your order. This entry was posted in Uncategorized and tagged coconut oil, giveaway, review, tropical traditions. Bookmark the permalink. Pingback: Just one of those mornings « Eat. Live. Be Healthy. I just followed you on twitter (3hpvegan), tweeted appropriately, and subscribed to the newsletter. As for the recipes, I’m intrigued by the idea of baking with coconut oil, so I’d like to try the pizza crust. As for the Tropical Traditions website, I didn’t realize that non-hydrogenated shortening could be made from coconut oil. It seems like a great alternative for baking. I guess I’ve been entered 5 times now? Thanks for the opportunity! I want to try their chocolate or products for the face/body. can you tell i want to win! I really like coconut oil, too. I use it a lot for baking instead of margarine. i would LOVE to make the granola recipe!! i’ve subscribed to their newsletter! Lab tests have shown this Coconut Oil to have the highest levels of antioxidants. I’d totally love to try the exfoliator! I’m sure it smells yummy! I find it interesting that [from the web-site] that they found SO many ways to add coconut oil into EVERYTHING. recipe? I want to check out those chocolate macaroons, but will have to find a way to veganize them. I checked out the website and I totally want to try the coconut peanut butter…yum!! I also checked out the recipes and would make the coconut peanut butter meltaways…double yum. I’m interested in the coconut peanut butter… sounds like spreadable heaven! I also liked the Gluten Free Chocolate Coconut Chewies recipe on the website. I am going to make them too! I am already following and I already subscribe to the newsletter too. pumpkin coconut cream soup is something i would totally make! Oooo…I would love to try their organic coconut flour and moisturizing cream!! Wow, I’ve read so many great things about Coconut Oil but especially about its moisturizing capability! I think one of the recipes that’s caught my eye would be a veganized coconut frozen yogurt! I follow you on Twitter (at)galabytes! Love their products…would love to get that vegetable juicer some day! i love coconut oil! i learned that it can be used for everything from an exfoliator to baked into granola! wow a lot of their recipes sound great! i think id want to try Coconut Banana Ginger Brown Rice Pudding with Raisins!!! 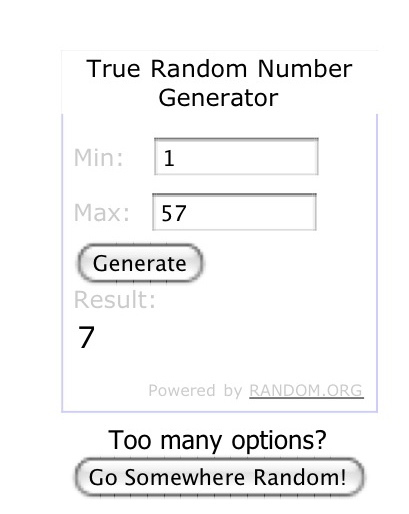 Thank You So Much Random Number Picker! and Lindsay and TT’s!!!! You guys rock!!!!!!!!!!!!!!!!! !